Damaged equipment may cause serious personal injury. Do not use damaged equipment. If abnormal noise or vibration occurs have it checked, serviced and approved before further use. 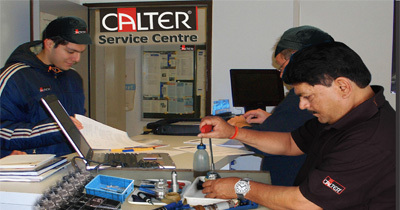 Please send your tools and concerns to an Authorized CALTER Service Centre or to any Authorized CALTER distributor or directly to the company, STI Industries along with duly filled Service Centre form. 1. Before each using, inspect the general condition of the tool. Check for loose screws, misalignment or binding of moving parts, cracked or broken parts or any other condition that may affect its safe operation. 2. After using, clean external surfaces of the tool to prevent it from rusting because of oil or other factors. Store the tool in a dry environment. 3. 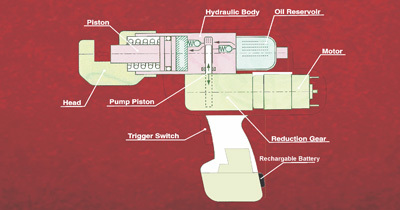 Service and repair of the tool should only be performed by an authorized technician. The WARRANTY is NOT valid if the tool has been tampered with by an unauthorized person and any costs for repair and spare parts will be charged to the user. 4. In order to prolong the life of the tool please change the oil every 4 months. Make sure oil is filtered by 120 mesh net or over 30µm strainer. Avoid dust into the oil cup. After long use the sealing kits will be damaged, in case of leakage please contact CALTER SERVICE CENTRE or any of its representatives.